Hi everyone, I'm over on the Pretty Pink Posh blog and YouTube channel today with a brand new tutorial. I haven't done a 3 Cards 1 Stamp set video in a while and I thought using the new School Friends stamp set would be perfect for one of those videos. Here are the three cards I made for today's video, head over to the blog to read more information about each one or the video is linked down below. Thanks for stopping by today and I'll catch you all next time. I learned so much from this video. I LOVE the way you Copic color, I need to improve but get so overwhelmed with some tutorials. Your technique makes me think I could achieve a nice effect without spending hours. 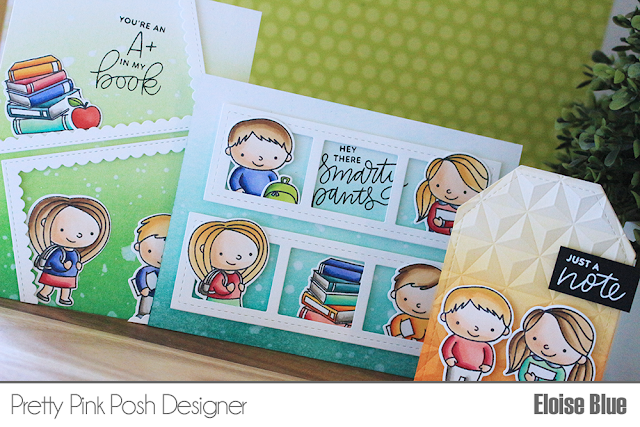 Such cute cards, thanks for sharing your process.